Hallowed Grounds - April Newness and New Deal! Hallowed Grounds; a Hidden Gem! Hallowed Grounds Coffee Roasterie is home of heavenly roasted coffee, specialty teas, gifts, and goodies! 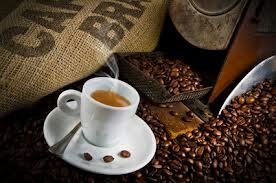 We import coffees from around the globe and roast them fresh. Like fine wine, each coffee is a unique treat. We started our business in 2007 and are in our 11th year. Hallowed Grounds is not your typical coffee shop. There are a couple of tables where folks can sit, but most people get their coffee and go. We are a roaster/retailer. Most of our business is done in bagged coffee for home brewing. Liquid coffee or drinks are secondary. Rounding out the mix is everything else; tea, gifts, baked goods, Bavarian nuts, and fresh ground nut butters. We have the best selection of coffee and tea in the valley! The name for Hallowed Grounds comes from the Bible in Exodus Chapter 3:5, where the Lord says to Moses, “Take off your shoes, for the ground you are standing on is Hallowed Ground.” When choosing our name and our location, we were unaware of how appropriate it was. Many consider the grounds where we are located to be hallowed in a special way. The little town of New Brighton played a big part in the Underground Railroad. So, it was fitting that we named our business Hallowed Grounds and located in New Brighton. We sell over 15,000 pounds of coffee a year. We get 1500 pounds of fresh green beans delivered monthly. People are amazed when they see the pallet of burlap sacks full of coffee, sitting in front of our store. If you’ve never been in, stop by. It’s an experience you won’t forget. We are located four doors down from the famous Hot Dog Shop on the same side of the street. You will be met with a heavenly aroma. Next, you see bins of fresh roasted beans and jars of tea leaves. In the back you find burlap bags of fresh green coffee beans. You can check out our roasters and witness the roasting process. Our store has an old fashion country appeal! Don’t drink coffee? We have options. Tea drinkers love Hallowed Grounds too! And those who don’t drink coffee have occasion to serve coffee to guests periodically. Or you can give coffee and tea as gifts. Non-profits receive special pricing. Consider using Hallowed Grounds for your next event. We also do fundraisers, so if your organization needs money for ski camp, summer camp, or a mission trip, come to Hallowed Grounds. Coffee, tea, and nut products are stable alternatives to candy and hoagies. Coffee & tea themed weddings and showers are popular. Let Hallowed Grounds make your day special with coffee or tea themed favors for a reasonable price. Gift baskets and boxed gift sets are great for corporate gifts or door prizes and make people that you want to thank feel appreciated. Call, click, or stop in today and discover the hidden gem of Hallowed Grounds! And don’t forget to vote for us for Best Local Coffee Shop at timesonline.com April 15-29. Mention this ad and get a FREE cup of coffee with purchase of a pound!